Elianna Vazquez, 18, who was seriously injured in a house explosion north of Mandan just before Christmas, will graduate from St. Mary's Central High School on May 28. Through faith and determination, Elianna has regained most of her physical strength since the explosion that killed her mother and stepfather. Two people are dead after a house explosion north of Mandan early Dec. 14. She was dressed in a tank top that showed off her toned arms and sparkly earrings that highlighted her blue eyes. Running a couple minutes late, a few black curls stuck to her face. Elianna says she is excited about her upcoming graduation from St. Mary's Central High School, looking forward to starting online college classes to become a jewelry consultant. In addition to that, she's been building up miles in preparation for a half marathon. Few would know that five months ago, the 18-year-old was lying in a snowbank, surrounded by rubble, expecting to die. Or that she still suffers aches, pains and fears at night. "My faith has to do with it a lot," Elianna said in her first extended interview since the explosion. "I'm still really the same person." Elianna usually looks forward, but, sometimes at night, her mind turns back to the house propane explosion, which killed her mom and stepdad, Elizabeth and Clyde Howe, on Dec. 14. She wasn't feeling well that day, so she left school early and hung out with her mom. She left the house for a while and returned around 8 p.m — to a very weird odor. "I was like, what is that smell?" Elianna said. "It hits you like a wall." She thought it was probably a frozen sewer pipe and so did her parents, she said. So she and her mom spent the evening huddled around the computer, googling gemology programs and talking about school. Around 10 p.m., she said good night. "I remember, I was joking around with her. I was like, Mom, am I going to die from these fumes?" she said. "And she's like no, you're not, and laughed at me. And I went to bed." Those were the last words Elianna would say to her mom and stepdad. "The next thing I know, I wake up at 12, and I'm laying in a snow bank," Elianna said. "I remember laying in this pile, grabbing pieces off of me, looking and seeing nothing but rubble and the heat off the house." She screamed and tried to get up. But she couldn't: Her lower back was shattered. Six ribs were broken. One of her lungs had collapsed. And her organs were bleeding. "I thought it was a dream," she said. "And then, all of the sudden, in the few quick seconds, it became way too real to be a dream." She screamed for help and started to pray: "OK, I'm going to die. And I just accepted it." But a neighbor heard. He was plowing snow and rushed over with his pickup. Soon, she was in the back of an ambulance. She'd figure out before long that her mom died on scene, and her stepdad, who was awake and talking all the way to the hospital, died of cardiac arrest. 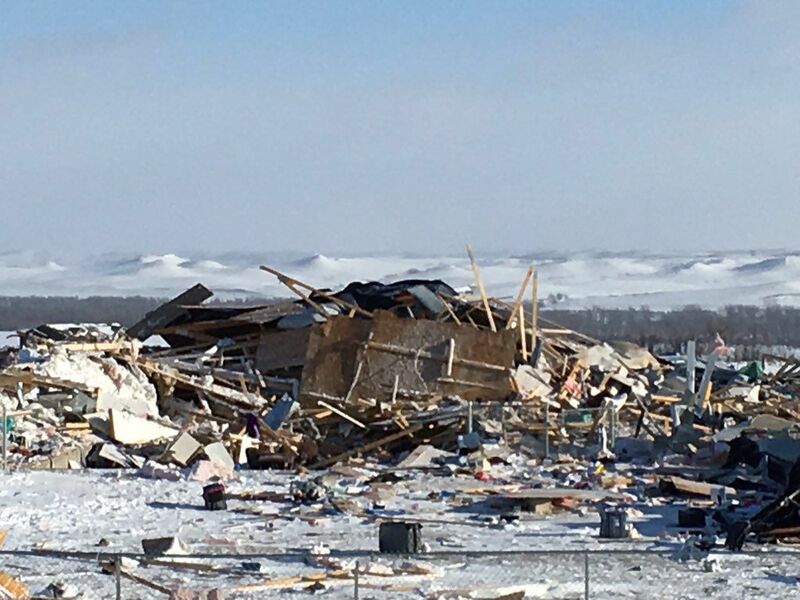 The explosion flattened the 4-year-old ranch style house, which was situated in a subdivision on North Dakota Highway 1806 north of Mandan, sending rubble in every direction and shaking the neighbors' homes. The cause was a propane leak, according to an investigation by the Bureau of Alcohol, Tobacco, Firearms and Explosives. In particular, a buildup of snow outside the house caused a secondary regulator of the propane line to malfunction, causing the crawl space to fill with gas, spokeswoman Ashlee Sherrill said. It’s unknown what sparked the gas and caused the home to blow up. According to a report from the Morton County Sheriff’s Department, the house used geothermal and electric heat, except for an oven, fireplace and possibly a garage furnace that were supplied with propane. What Elianna and her family smelled was likely not sewage, but rather the odor given to propane to alert families of a combustible leak. After the explosion, Elianna spent 10 days at CHI St. Alexius Health. Doctors fused together her shattered lower spine. She needed a two-liter blood transfusion and a chest tube. When she was discharged, she went to stay with her dad, whom she had not lived with in several years. She was out of school for about a month while she regained her strength. At first, she attended one to two classes a day. It was hard to breathe, and that was exhausting. Now she’s up to five. She worked her way through physical therapy to regular exercise, including a core workout that she modifies to avoid using her lower back. She still attends as many as five appointments a week with physical therapists, doctors and a psychologist. Next Sunday, she'll graduate from St. Mary's Central High School. If her mom could have been there to see the graduation, "she would have been really proud," said Elianna's older sister, Gina Vazquez. The high school principal, Reed Ruggles, called her a "driven young lady" with "mental fortitude." The school cut back some of her assignments to focus on the "need to know" so that she could earn her diploma. Elianna attributes her recovery in large part to her Catholic faith, which has taught her to see the explosion as fated. "I just accepted it," Elianna said. "You’ve just got to press on, because you cannot change it, whether you like it or not." She still doesn't know what the reason was for the tragedy, though she wonders if it wasn't to take her mom out of her suffering. Elizabeth was in considerable pain prior to her death, Elianna recalled. She was a nurse, who worked multiple jobs, including nights, and it took a toll on her body. Just days before the explosion, she had hand surgery. Elianna also said her mom's legacy — of teaching her kids to be independent — has helped her stay composed as issues of health, money and lawsuits have come before her. She has also has strong support from friends and family, including her boyfriend’s family, who act as second parents, her boyfriend's sister, Kelsey Pierson, said. At a recent Mother’s Day concert, she gifted her boyfriend’s mom a rose. They are co-hosting a graduation party for her with Elianna's dad. Despite her good spirits, Elianna still suffers considerably from the accident. The explosion brought on post-traumatic stress disorder, she said. She's often anxious about getting into an accident. She still hasn't returned to the house. And, especially at night, she grows fearful. There’s also daily headaches and neck pains. And she can't bend down ever again, so if she wants to reach for a dropped napkin, she'd have to squat. Elianna is grateful that money from a trust set up by the school, insurance policies and wills have made it so she can afford her medical expenses and future schooling. The family also is working with attorneys to sue parties, who may be responsible. “I just want someone to be wrong and know that they’re wrong,” Elianna said. Recently, Elianna moved in with her childhood friend, Alayna Pulkrabek, a senior at Mandan High School. They’re house-sitting in Mandan for the summer. Most nights, they’ll watch a TV show together — often "Keeping Up with the Kardashians" or "Grey’s Anatomy" — and make tea. Then they’ll settle in together in the same bed, so Elianna won’t be alone if she lays awake at night.